Peck has been a highly-respected member of the WNY sports media for nearly 30 years. During that time, he has displayed his skills in reporting on the area’s pro, college and high school teams. While he will work to build VSP’s connection to enhancing sports teams and facilities, Peck will continue his various roles in sports broadcasting and media. He is currently the Voice of UB Bulls Football, in addition to the host of the school’s football and basketball coach’s TV shows. Peck hosts the Beat the Champ bowling show on WBBZ-TV, and is co-host of the Sylvester & Peck On Sports podcast with Buffalo sportscaster Kevin Sylvester. 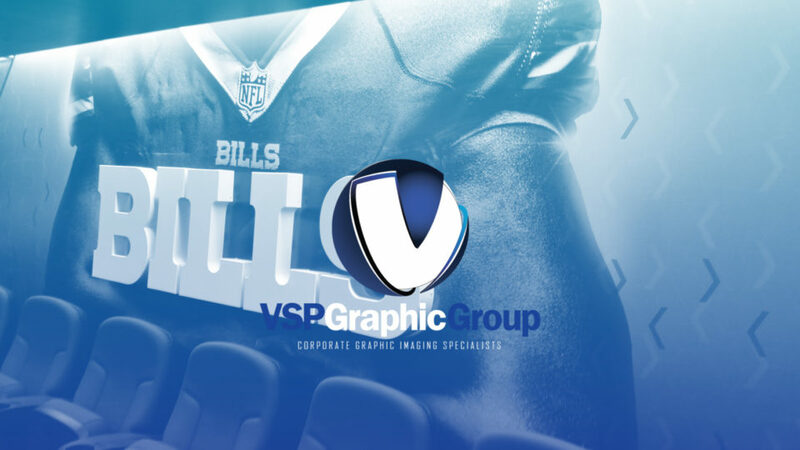 VSP Graphics is the official graphics company of the Buffalo Bills and Buffalo Sabres. They have created athletic area enhancements for both teams, along with the UB Bulls, St. Bonaventure Bonnies and many local high schools. VSP has a proven track record of elevating athletic facilities that inspire athletes, coaches, students and alumni. VSP specializes in commercial branding imaging, and its main concentration is taking corporate and athletic environments, and turning them into spectacular architectural interiors and exteriors. Many local architects and interior designers utilize VSP for creative solutions to complement their environments. The opportunity to build up college programs to resemble pro environments, and high schools to parallel college teams, is VSP's main directive.